President Jacob Zuma sent good wishes on Sunday to matric students about to start writing their final exams. 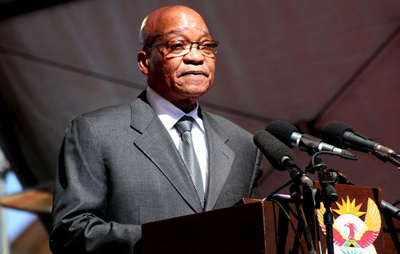 “We are happy with the gradual improvement in the outcomes each year,” Zuma said in a statement. In 2008, the matric pass rate was 62.6 percent. It dipped in 2009, but improved to 67.8 percent in 2010 and to 70.2 percent last year. “We wish to remind all that education is a societal issue. Let us work together to support the learners and the educators,” said Zuma. Well-wishes for the matrics, who start writing their final exams on Monday, poured in from political parties, provincial governments and unions. Limpopo Premier Cassel Mathale said that province had produced the best science pupils from rural backgrounds. Throughout the year, the department had made sure that students would be ready for the exams by running extra classes and revision camps, he said. The Western Cape government said it was time for the class of 2012 to shine. “This government is committed to improving the number of learners who write and pass the… examinations and this year we hope to achieve a stretch target of between 38 000 and 39 000 passes,” education MEC Donald Grant said. North West Premier Thandi Modise sent a message of support to all matrics. “With fewer disruptions in learning and teaching in most parts of our province this year, we are confident that the 2012 matric class will do us proud and sustain the improvement in the results we have recorded over the past three years,” she said. The SA Democratic Teachers’ Union (Sadtu) also wished the matrics well. “The matric certificate is the most crucial certificate in one’s schooling life,” it said. The Democratic Alliance said this was matric pupils’ time to make it count. “They have reached the pinnacle of their school career, the culmination of 12 years of sacrifice and hard work,” said DA MP Annette Lovemore. The Inkatha Freedom Party Youth Brigade said South Africans needed to rally behind matric students. “May your hard work, commitment and dedication to your school work pay off positively,” it said.